Save money shipping on eBay by stacking coupons at Walgreens! 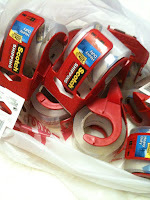 During the week of April 4, 2011 Walgreens has a coupon in their circular for Scotch shipping tape 2 / $3 with a limit of 4 total. Using the $1 off coupon located here, you can walk away with 4 rolls of Scotch shipping tape for $2! That is 50¢ per roll for high quality packing tape. Become a Facebook Fan of piece-of-scrap for money saving tips, including extreme couponing and learn what to sell on eBay!